I AM FALLING in love. It's a beautiful thing. I'm wiping away a tear as I write this. Well, not really. But a new guitar will do that to you. Second String Music is now officially a Reverend Guitar dealer. I am the proud owner of a beautiful orange Flatroc, and it is one of the most amazing and responsive guitars I've ever owned. Reverend Flatroc (left) and the Sensei 290. I met the owner, Ken Haas, at the Dallas International Guitar show. We got to talking and it was obvious Ken understands the small and family-owned music store. 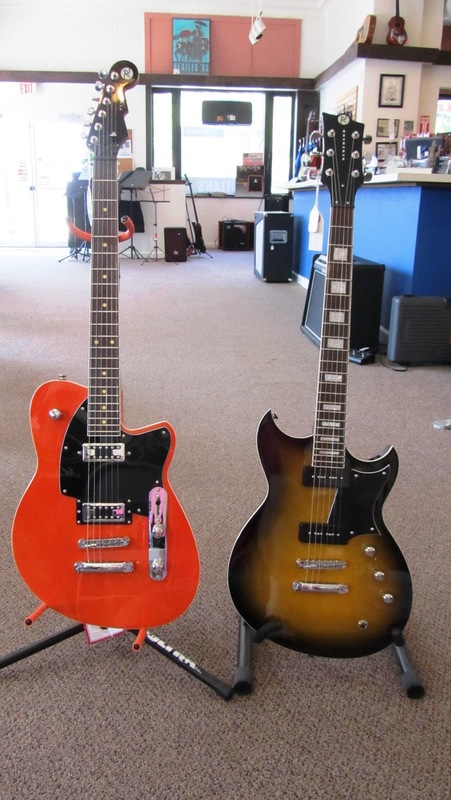 Now we have the Flatroc and the Sensei 290 in the shop, but I made the mistake of playing the Flatroc and it's mine. I've said this many times, but people who limit themselves when it comes to guitars and amps only cheat themselves. I understand about being a Les Paul or Fender guy, or a Taylor or Martin player, but if you refuse to try other stuff and only want to plug into your monster Marshall stack, well ... so be it. I'm on the other end. I have a beautiful Highway Strat. I have a rare late 80's Gibson/Epiphone Les Paul. I have a rockin' Jon Kammerer guitar. I just played a Cheeseburger gig with a new 80-watt Roland Cube and I was stunned at how good and clean it sounded, though I still love my Orange Tiny Terror tube amp. I have a Blueridge acoustic and now I'm eyeing one of the new Takamine Pro Series acoustic guitars in the store. Shhh. Don't tell Sheryl. In the end, it's about feel and the connection with the instrument. If you sit down and an instrument speaks to you, it sounds good and there is something just right about it, you'd be foolish to ignore it because of the name or the price. Hanging out in the Masonic Lodge parking lodge, circa 1999 ... from left, Emily Kipley, Emily Hart, Karlee Dreyer and Jaclyn Cawthon. IT'S GUS MACKER weekend in Quincy, one of my favorite times of the year, and there are lots of memories. I worked for Gus for seven summers all over the Midwest and had a lot of interesting, strange, hilarious and downright hair-raising experiences. I'd do it all again and maybe I'll get back to traveling with the circus if the dust ever settles in the Q-town. I have friends for life because of working for Gus. My buddy Jason is the foreman this weekend and is already in town building baskets. I met some amazing people, including the Energizer Bunny himself, Scott McNeal, aka Gus Macker. The guy woke up with steroid toothpaste at the crack of dawn and never stopped until his phone died at about midnight. I will be calling games on the Dream Court, right outside the Second String Music doors at Fifth and Maine. 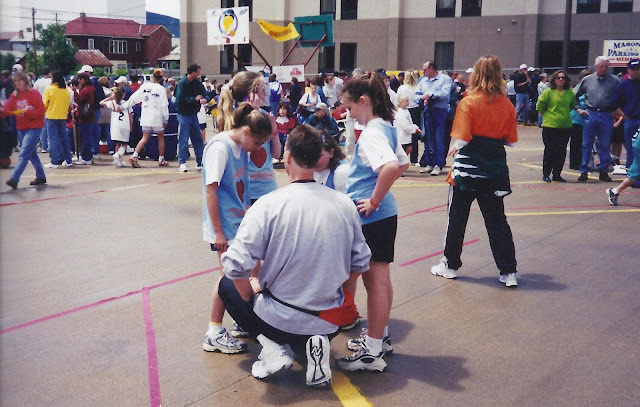 Quincy was the first tournament to have a Dream Court, where kids are taken off their regular courts and we play on a special surface, with starting lineups and announcers. Emily played in five or six Mackers with her buddies. The pic up top just makes me smile. As you can see by their team name, No Weak Treats, it didn't matter how they played or how many games they won or lost. They just wanted a treat after they were done. And that's what I remember the most. IT'S BEEN MORE than a month since The Cheeseburgers last played, so we are itching to get back out there and kick off the summer right. We play at one of our favorite venues, One, on Friday night. The last time we were there was St. Patrick's weekend and it was out of control, just the way we like it. The next morning we play at the Bridge The Gap To Health walk and race at Clat Adams Park. Sure, it will be a challenge to be awake at 9 in the morning, but with all the people down there and good weather, it's guaranteed to be a good time. We are playing on the Quincy Park District stage and it's a gorgeous setting, right on the mighty Mississippi River. Clat Adams Park isn't utilized enough and we can't think of a better way. Even if you aren't participating in the run or walk, you can come down and hang out. We are ready to rock, and let the summer begin! YOU NEVER KNOW who will stop at Second String Music when we are having a Happy Hour jam session. We are cruising along when I see this guy come up and start playing a shaker. 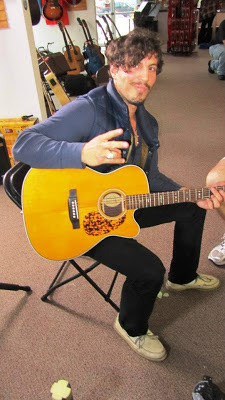 He's very cordial and way into what we are doing, which is sitting around with acoustic guitars and making noise. Then somebody says, "Hey. You are Josh from Steel Magnolia!" Yup. That's right. A guy who has played the Grand Ole Opry, opened for Bob Seger and is making waves in country music is in our store, and all he wants to do is jam. Steel Magnolia was in town last night at a club and Joshua Scott Jones was wandering around when he saw us playing. He kept trying to get up and leave and we kept making his sit down to play, until he finally gave us a lame excuse about getting ready for the gig, or something like that. He couldn't have been a nicer or more humble person. Here's a guy who has played in front of thousands of people, but after sitting in with us and playing everything from Bob Dylan to Tom Petty to Eric Clapton, he said, "This is what it's all about." Thanks for hanging with us, Josh! LATELY I'VE HAD guitar on the brain. Maybe it's the fallout from going to the Dallas Guitar Show, or maybe it's several students who want to learn some very cool songs. Maybe it's hanging out with the kids at Union United Methodist Church. Or maybe it's the fact I'm a very average player who wants to get better, and I own a music store, and I better be able to play, dang it. 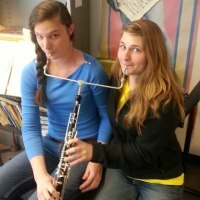 I talk a lot to my students about feel and touch, but I'm too heavy-handed strumming chords. I gotta work on that. I'm looking into getting a new guitar, one to play out with the Cheeseburgers, one nobody else around here has, one that will rock and roar and look cool and make me a better player, just by default. That kind of guitar doesn't exist. But I can still dream. I should be doing something constructive, like sanding the floors in the house, raking up the hay from mowing the lawn, learning how to use QuickBooks. Or writing my Local Q blog. Or getting Sheryl lunch. Nah. I'm learning how to strum 7th blues chords, pick out lead scales, and how to play the Star Spangled Banner in G.
Maybe I'll get better at this guitar thing, yet. THE MOST FRUSTRATING thing about the weather isn't, well, the weather. It's the way Mother Nature toys with us. Earlier this week is was picture perfect, sunny and 70, shorts and a T shirt. Today it's cold, rainy and there's snow coming. Or so claims the weather map. What? Snow? In Quincy? In May? 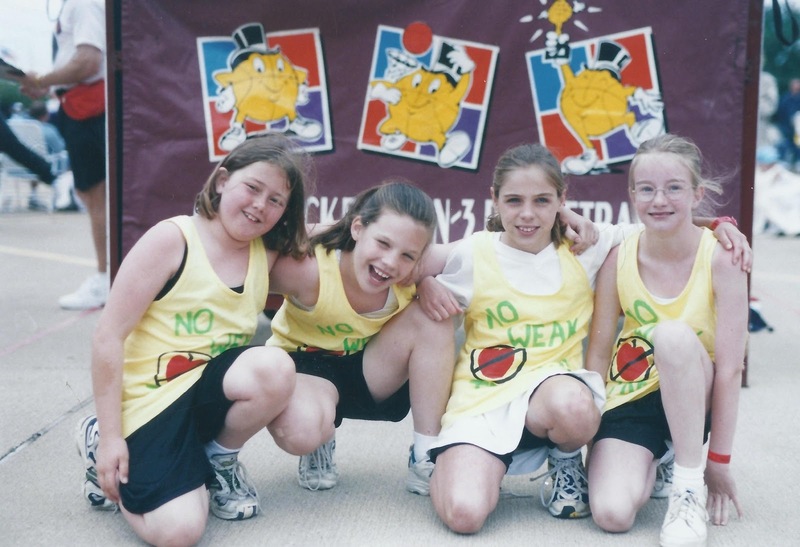 Many years ago I played in a Gus Macker tournament in Gaylord, Michigan. It snowed. Nobody blinked an eye, because it was Northeast Michigan, even though it was the middle of June. But in Quincy, in May, this is not acceptable. It's like driving all the way to Walmart or the mall. We'd really rather not deal with it. If it snows today in Quincy, the new mayor might just replace the incumbent meteorologist, the headline on the front page of the paper will be HUGE and the Dogwood Parade Saturday will feature a lot of hats and gloves. I don't think Mother Nature cares.